"Our art is a reflection of our reality." Straight Outta Compton was always going to be an inherently compelling and captivating story based on the subject matter of following the careers of members of the groundbreaking rap group, N.W.A (aka N*ggaz Wit Attitudes). Its unique success story of urban unrest during a turbulent time and place ultimately suffers from the same problems of most musical biopics and autobiographical histories as producers Ice Cube, Dr. Dre, and Tomica Woods-Wright (Eazy-E's widow) all have vested interests in cementing their respective ongoing legacies, images, and million dollar brands. Friday director F. Gary Gray is unsurprisingly able to channel all the propulsive, raw energy of N.W.A's early years going from the rough streets of Compton to mainstream success. The scenes of racial turmoil, run-ins with the LAPD, and early rap performances are gripping and thrilling. 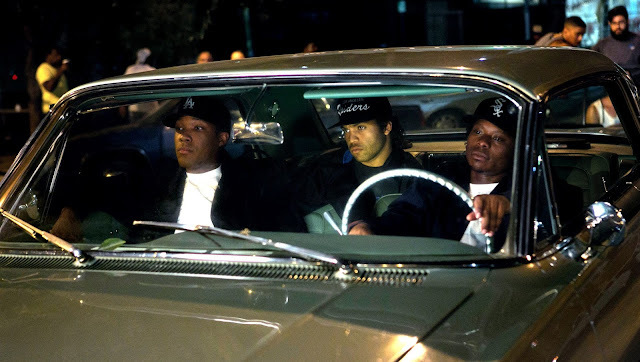 Cast members O'Shea Jackson Jr. (Ice Cube's actual son playing his father), Corey Hawkins as Dre, and Jason Mitchell as Eazy-E have a dynamic chemistry and give authentic feeling performances throughout. Mitchell in particular is so lively as he captures all of E's charismatic and frustrating ticks just as Jackson is an uncanny mirror image of Cube's angry younger self. Jackson has the same screen presence as his father without any of elder's trademark humourlessness. Like in real-life, DJ Yella (Neil Brown Jr.) and MC Ren (Aldis Hodge) are largely pushed aside (as is Arabian Prince almost entirely) as after thoughts—as are any of the women involved. "Bye, Felicia!" The film's unfocused second half shifts into essentially extended contract disputes transitioning from the gritty streets of South Central Los Angeles to offices, boardrooms, and business deals with shady manager Jerry Heller played by Paul Giamatti, because of course. It's a detailed, lengthy dissection of the dissolution of N.W.A and the rise of Cube's solo career, Dre's acumen as a producer/businessman, squabbles with instigator Suge Knight, and the birth of Death Row Records. Compton's greatest weakness is the overabundance and wealth of material it chooses to include as it mythologizes our real-life characters. There's so many interesting backstories, including some more controversial incidents they conveniently choose to sidestep, explored to varying detail. Lakeith Stanfield's criminally minuscule role as a young Snoop Dogg almost dares to steal the entire film in just a couple short scenes as the filmmakers can't resist a cameo by Tupac Shakur (Marcc Rose) and an early cut of "California Love". Watching Compton is ultimately a lengthy exercise in self-mythology while comparing our past and present. N.W.A was such a controversial, inciting group yet it's hard to divorce Cube's image as a family friendly comedy actor (who frequently plays cops), Dre's status as an entrepreneur/mogul, and today's mistreatment of young African-American men by police. The film is in part so relevant and palatable because of both their looming influence in today's culture and ends with a quota touting their individual successes. What prevents the film from sinking is its continued focus on the music, its power, and path to production. However, much like N.W.A itself, Straight Outta Compton burns bright, peaks early, falls apart after Ice Cube leaves the group, and is all about the money.